Which country has the largest surface area in the world? 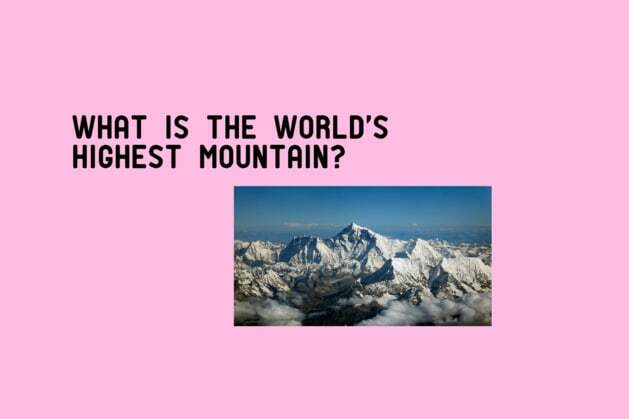 What is the world's highest mountain? Where is the ocean's deepest point? Which country does not border the equator? Which continent has the most independent countries? How many countries make up the UN? Which country is not part of the EU? Which country is not in Asia? What country does not border the USA? Which country has a larger population? Is Iceland made of Ice? Do people live in Antarctica? What is the busiest capital city in the world? Which country do people live the longest? What is the most active volcano on the planet called? You are in the top %!! You are one of 2 people in 94 citizens of the USA who actually knows what is going on in the world and where countries and capitals actually are. You could name every capital in the continent if you wanted to and geography was definately your strong point at school. You love to travel and stare at maps for hours conjuring up your next big adventure. Congratulations on possessing this skill and educating yourself about the wonderful world that we live in. Geography was never your strong point and you might often get your continents confused. Don’t worry though, the USA is a big country and there is a lot going on in it. Opening up a world map once in a while never hurt anyone but don’t feel downhearted, the world is a big place and you also have a life so knowing where everything is never interested you anyway.